When you’re working with teammates over a Slack video call, you may have something — a document, a chunk of code, the latest designs — that you want to share with your team. Now you can. Screen sharing is now available across teams on Slack’s paid plans. Screen sharing is an extension of Slack’s native calling feature, which is accessible from any channel or direct message. Start a Slack call by clicking the phone icon at the top of your screen, and then hitting the “share screen” button. If you’re using more than one monitor, you’ll be asked to select a screen, and presto — now you’re presenting! Participants on the call will be able to see all of your shared screen, including your cursor. While you’re presenting, Slack will temporarily disable the video feed from your camera, and then turn it back on once you’ve stopped sharing. Slack notifications are also muted while you present, so others see only what you want to share, and nothing more. To use screen sharing, you’ll need to have Slack’s calling feature turned on for your team. And if another calling application works best for your team, we’ve got plenty of integrations to connect them to your workflows in Slack. Need some inspiration for what to share? 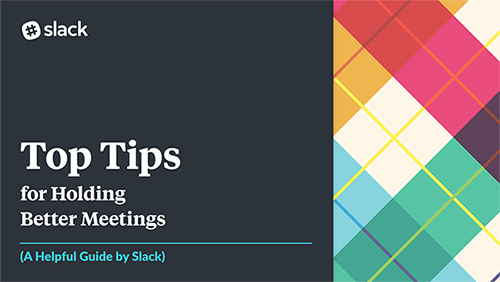 Here are some tips we put together on holding successful presentations (and meetings generally) in Slack, packaged appropriately… in a presentation. Screen sharing is rolling out over the next few days to paid teams on the latest versions of our Slack for Mac and Slack for Windows desktop apps. Screen sharing was built with the help of user feedback, so please keep the feedback coming or tweet us at @SlackHQ. Please visit our help center for more details on how screen sharing works.